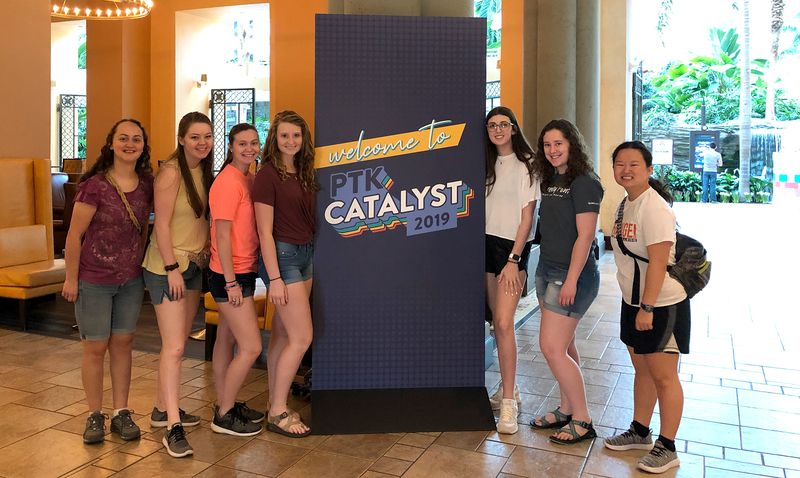 Seven members of Alpha Gamma Upsilon, the Ark City chapter of Phi Theta Kappa, and their advisor Deborah Layton recently returned from the 2019 International Convention, PTK Catalyst, held in Orlando, Florida. The super hero-themed convention hosted many events from April 4 – 7. Brianne Hutto, Emily Harris, Allison Wolfe, Bethany Wolff, Symantha Shelton, Megan Roth and Megan Giger attended general sessions and heard from keynote speakers on this year’s Honors in Action focus, Transformations: Acknowledging, Assessing, and Achieving Change. Outgoing International President, Elda Pere gave an incredible speech on finding joy, and Dr. Lynn Tincher-Ladner, PTK President and CEO, gave the keynote address on the quality of community colleges. She said that 49% of bachelor degree holders are community college transfer students and that we need to get rid of the stigma attached to two-year colleges. Professional speakers Mel Robbins and Jeff Henderson delivered inspiring messages about motivation, relationships and second chances. Best-selling author and entrepreneur, Robbins discussed her Five Second Rule, saying that everyone can change his or her life in a matter of seconds by breaking a negative pattern in the mindset. Celebrity chef and author, Henderson challenged students to get out of their comfort zone and “walk in [their] purpose” because when they do not have a purpose-driven life, they lack value systems and make bad choices. In addition, educational forums covered leadership and soft skills along with transfer and workforce readiness. Forums attended included Beating the Competition for Your Dream Job, Four Must Have Career Readiness Skills, How to Promote Yourself, Failing Epically: Celebrating Lessons Learned, Relearning Your ABC's- Attitude Builds Confidence, The Art of Engaging Conversations, Conflict Resolution 101: Building Cohesion Through Effective Communication, A Cheat Sheet for College Transfer, Overachiever and Stressed Out, Hit the Showers: A Slacker's Guide to Beating Writer's Block, Better Brainstorming Through Improv, Keeping Up! Resumes, Cover Letters, and Interviewing Tips, and Money Myths and Facts. Students also participated in a college transfer fair and the international officers’ campaign and caucuses, and voted for the new year’s representation. After going to the regional meeting, the students were excited to find that our Kansas Nebraska Region won awards for Excellence in Transfer Readiness and Career Readiness. The Gala on the last night had a parade of the top 30 Distinguished Member Awards, featuring our own Megan Roth, and a dance and games. Between sessions, students were able to take in the wonders available to them through the Gaylord Palms Convention Center like the huge, glass atrium housing juvenile alligators and a variety of turtles, and a water park, and they went on a fellowship activity to Universal Studios Island of Adventure. Students returned home to Cowley exhausted from all the activity but with a rejuvenated energy to work on their college project, the student pantry. Pictured, from left, is Symantha Shelton, Emily Harris, Allison Wolfe, Brianne Hutto, Bethany Wolff, Megan Giger and Megan Roth.